Perhaps you often purchase a ticket from The Vrienden Lottery. In Dutch ‘Vrienden’ means ‘Friends’. This organization was established in 1989. Among some old Dutch lotteries it’s quite young. During the establishment it acted as an independent lottery. Nowadays it works together with the Postcode Lottery and the BankGiro Lottery in a holding company. The Vrienden Lottery was not only established for people who dream of becoming a millionaire. It also supports several charities, for example some welfare and health institutions. Actually, about 50 percent of the total revenue of The Vrienden Lottery goes to these institutions. Since 1989 the Vrienden Lottery has changed quite a lot. It was created more than 25 years go by the welfare foundation Humanitas as the Sponsor Bingo Lottery. It took several years change until the Vrienden Lottery became part of a holding. Since 1998 it has been working together with the Postcode Lottery and the BankGiro Lottery. Together they’re part of the ‘Holding National Charity Lotteries’. Main reason to do so was actually their love for charities. These lotteries want to support as much charities as possible. Interestingly enough, they all have their own specializations. For example, the Vrienden Lottery focuses on welfare, sport and health. The Vrienden Lottery has 49 permanent partners in the field of welfare and health. For example, it supports the Diabetes Foundation, the Dutch Heart Foundation and the Lung Fund. However, you can actually support another foundation if you want to. Perhaps you like to support your local football or basketball club. This is definitely possible at this lottery. Many participants have done this before you. There are probably thousands of sports clubs who receive donations from The Vrienden Lottery. Therefore, the number of charities and foundations supported by The Vrienden Lottery is more than a thousand. About 450.000 people play in The Vrienden Lottery This seems quite a lot, but the lottery isn’t that big actually. The BankGiro Lottery already has 650.000 partipants, and the Postcode Lottery even more. The Vrienden Lotterij is also the youngest of the three. So it actually makes sense that the number of participants isn’t that high. Besides that, the number of people participating in The Vrienden Loterij is still growing. Playing in the Vrienden Lottery is definitely worth trying. You have a chance of winning by supporting charities at the same time. In this lottery you always play with your mobile telephone number. You could also use a part of the number, like five, six or seven digits. This is a big difference with other lotteries in which multiple tickets can be used. The fact that you only use your one number with two extra numbers makes the Vrienden Lotterij unique. On the other hand, you can use your number for several games. Usually you play with multiple tickets, but at the Vrienden Lottery it’s just your phone number with two extra numbers. Perhaps you’re having a feeling of dissapointment right now because you don’t have a mobile phone number at the moment. Or perhaps you don’t want to use your number because of privacy. No worries! The Vrienden Lottery also offers imaginary numbers that are equivalent to mobile telephone numbers. So this means you get 10 digits and two letters. These numbers and letters give you the possibility to play several lottery games. A lottery ticket from the Vrienden Lottery costs € 13.50, in Holland and fifty cents is used for the so-called Jackpot Bonus. The Jackpot is included in 12 of the 14 Vrienden Lottery draws a year. Of course you need to be very lucky to win the Jackpot. Even if you don’t, the chance of winning at this lottery is still quite high. The Vrienden Lottery offers more than 1.6 million prizes a year. This also includes products like free tickets, new cars and bicycles. You can even win films and boxes with TV-series. Cash prizes still make up the main part of all the prizes. 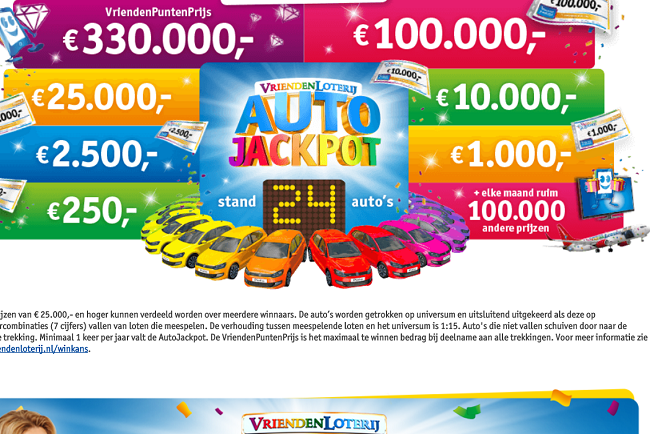 At the Vrienden Lotterij you can win € 250, but also the maximum of € 100.000. Sometimes the lottery draw also leads to nice prizes like € 1000 or € 10.000. Sometimes you share a big win other people. For example, 25 people can all win € 1000.00. Hopefully you’re one of them!